Assets should be much improved. While this for sure is not on the highest list, i think the assets at the moment are not developed enough..
1. As far as i have seen, you can only make a folder and a subfolder. If you need to make a deeper three as iwould have to do for our corporate Designs, that we use for our comuication stuff, this is not enough. 2. Drag and drop at last from an opened document to the Assets pannel should be enabled..
3. This should of course be possible for several Objects at a time. 4. Drag and Drop from outside of an Af Publisher file should be possible. for example from the Windows Explorer. 5. You should be able to define folders on your network, to be able to share content for the whole company. and..
6. You should be able to define Pathes for this, that you also should able to set while network installation , so everyone starts his new copy of shining Affinity Software, and can jump in from the start whith all footage he/She needs. 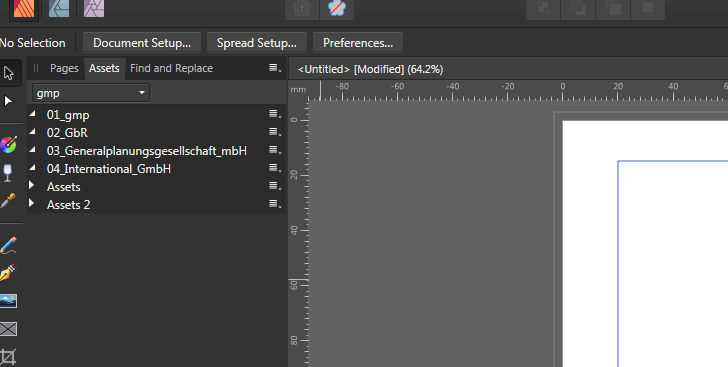 Problem is, you first have to make your folders on the left in the Hamburger menue..
After this you go to your folder in the assets. then you bring some footage to your document, you select it, and in the Hamburger menue you now can say... something like... get your asset from the selected contend... (dont remember the exact command.) but exactly this is horrible cumbersome, without any drag and drop, and only works for stuff you allready have inside your document..
so drag and drog would be welcome as well as navigating to a predefined folder on your networkstrukture..
ah... allright.. i see .. there are even further limitations in the aktual build... so.. its not on my top priority but would be an improvement to fix this. An Asset folder can contain a lot of sub-folders. I don't know what the upper limit is (The iOS12 asset folder holds 20 sub-folders and it is possible to add more IF you wanted to), but since each sub-folder can hold multiple entries (asset), which can be dragged and dropped into a publication, each Asset Folder could easily hold 100 entries. You could make new Asset folders (Category) for each main subject by clicking on the 'hamburger' for Assets and then new Subcategories in each, giving you a large number of assets. Once you have built up all of the assets you need , you could export these assets to a location, either for you to import in the future, or for associates to import into their Publisher for their use. yes there may be some limitations such as having to use vector graphics (so they can be scaled when inserted), but once you have built up a 'library' it it such a time-saver to be able to quickly select an asset, from your saved assets, into any publication. I'm not sure (nor overly worried about where Publisher saves these assets in it's programme file, but it is as important as with any file to make a backup of your assets by using import and export of your assets; in fact this enables you to build up separate libraries for different purposes.